S. boulardii is a tropical strain of yeast first isolated from lychee and mangosteen fruit in 1923 by French scientist Henri Boulard. Boulard first isolated the yeast after he observed natives of Southeast Asia chewing on the skin of lychee and mangosteen in an attempt to control the symptoms of cholera. S. boulardii has been shown to be non-pathogenic, non-systemic (it remains in the gastrointestinal tract rather than spreading elsewhere in the body), and grows at the unusually high temperature of 37°C. Two studies each showed a significant reduction in the symptoms of acute gastroenteritis in children, versus placebo, by measuring frequency of bowel movements and other criteria. Children over three months are recommended to take two doses of 250 mg a day (BID) for five days to treat acute diarrhea. [2, 3] Children under three months are recommended to take half a 250 mg capsule or sachet twice daily for five days. Austrian vacationers taking S. boulardii traveling around the world were found to have significantly fewer occurrences of travelers’ diarrhea than those taking placebo. The more S. boulardii taken in prevention, starting five days before leaving, the higher the reduction in diarrhea reported. The reduction was also found to be dependent upon where the vacationer traveled. The recommended dosage is one 250 mg capsule or sachet per day (QD). S. boulardii has been shown to significantly increase the recovery rate of stage IV AIDS patients suffering from diarrhea versus placebo. On average, patients receiving S. boulardii gained weight while the placebo group lost weight over the 18 month trial. There were no reported adverse reaction observed in these immunocompromised patients. Vandenplas Y (July 1999). 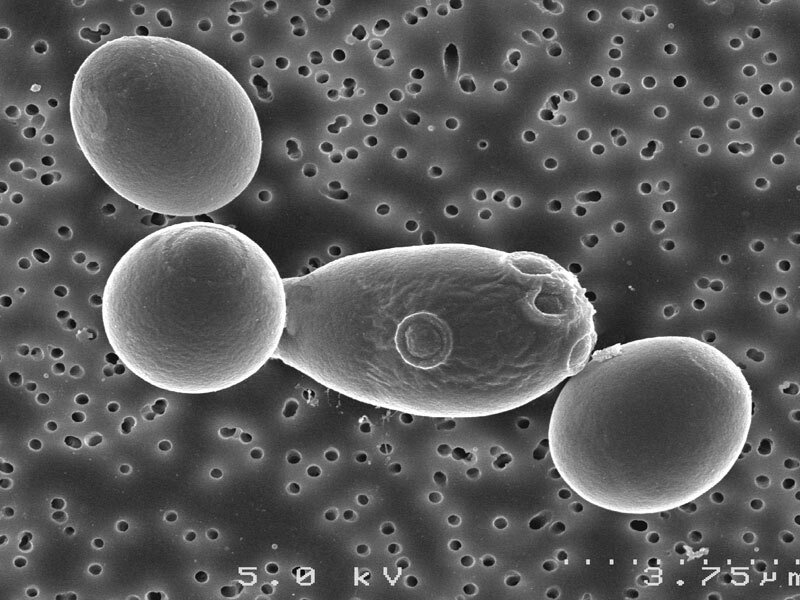 “Bacteria and yeasts in the treatment of acute and chronic infectious diarrhea. Part II: Yeasts”. Clin. Microbiol. Infect. 5 (7): 389–395. doi:10.1111/j.1469-0691.1999.tb00162.x. PMID 11853563. Centina-Sauri G, Sierra Basto G (1994). “Therapeutic evaluation of Saccharomyces boulardii in children with acute diarrhea”. Ann Pediatr 41: 397–400. Kurugöl Z, Koturoğlu G (2005). “Effects of Saccharomyces boulardii in children with acute diarrhoea”. Acta Paediatr. 94 (1): 44–7. doi:10.1080/08035250410022521. PMID 15858959. Höchter W, Chase D, Hagenhoff G (1990). 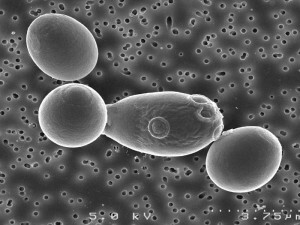 “Saccharomyces boulardii in acute adult diarrhoea. Efficacy and tolerance of treatment”. Münch Med Wochenschr 132: 188–92. McFarland L, Surawicz C, Greenberg R (1994). “A randomised placebo-controlled trial of Saccharomyces boulardii in combination with standard antibiotics for Clostridium difficile disease”. J Am Med Assoc 271 (24): 1913–8. doi:10.1001/jama.271.24.1913. PMID 8201735. Maupas J, Champemont P, Delforge M (1983). “Treatment of irritable bowel syndrome with Saccharomyces boulardii: a double blind, placebo controlled study”. Medicine Chirurgie Digestives 12 (1): 77–9. Guslandi M, Mezzi G, Sorghi M, Testoni PA (2000). “Saccharomyces boulardii in maintenance treatment of Crohn’s disease”. Dig. Dis. Sci. 45 (7): 1462–4. doi:10.1023/A:1005588911207. PMID 10961730. Guslandi M, Giollo P, Testoni PA (2003). “A pilot trial of Saccharomyces boulardii in ulcerative colitis”. Eur J Gastroenterol Hepatol 15 (6): 697–8. doi:10.1097/01.meg.0000059138.68845.06 (inactive 2010-03-18). PMID 12840682. Kollaritsch H, Kemsner P, Wiedermann G, Scheiner O (1989). “Prevention of traveler’s diarrhoea. Comparison of different non-antibiotic preparations”. Travel Med Int: 9–17. McFarland LV, Surawicz CM, Greenberg RN, et al. (1995). “Prevention of beta-lactam-associated diarrhea by Saccharomyces boulardii compared with placebo”. Am. J. Gastroenterol. 90 (3): 439–48. PMID 7872284. Kotowska M, Albrecht P, Szajewska H (2005). “Saccharomyces boulardii in the prevention of antibiotic-associated diarrhoea in children: a randomized double-blind placebo-controlled trial”. Aliment. Pharmacol. Ther. 21 (5): 583–90. doi:10.1111/j.1365-2036.2005.02356.x. PMID 15740542. Saint-Marc T, Blehaut H, Musial C, Touraine J (1995). “AIDS related diarrhea: a double-blind trial of Saccharomyces boulardii“. Sem Hôsp Paris 71: 735–41.